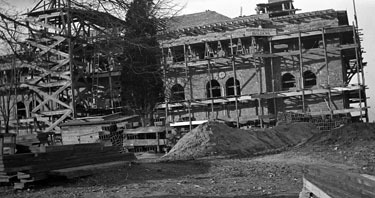 Geophysical Laboratory building under construction, 1906. Made rich beyond any man’s wildest dreams through wise investments and the booming steel industry, Andrew Carnegie sought to share his wealth to advance knowledge and education. Over his lifetime, Carnegie had contributed to just causes associated with literature, education, and the arts. In 1901, he became interested in science. America’s top minds immediately sprung into action, bombarding Carnegie with hundreds of different opinions about how to donate his money. Initially, Carnegie planned to fund a great new American university for science, but after a meeting with Daniel C. Gilman, the soon to be named President of the Carnegie Institution of Washington, and John S. Billings on November 16, 1901, he changed his emphasis from education to research and post graduate training. On December 2, Carnegie formally announced the future gift of ten million dollars for a scientific institution in Washington, DC. It took the Earth scientists only two weeks to respond. On December 16, 1901 George F. Becker, the then director of the physical laboratory at the U. S. Geological Survey, submitted an outline for a geophysical laboratory entitled “Concerning the Geophysical Laboratory” to Charles D. Walcott, who was soon to be appointed Secretary of the Carnegie Institution's Board of Trustees. More detailed proposals were submitted the following year by the Advisory Committee on Geophysics for the Carnegie Institution of Washington and the "Committee of Eight." By the end of 1903, the Advisory Committee on Geophysics agreed on and published a set of specific plans for staff, building design, budget, and organization for the proposed laboratory. With almost every detail arranged and accounted for, the Trustees officially approved and established the Geophysical Laboratory of the Carnegie Institution of Washington on December 12, 1905. 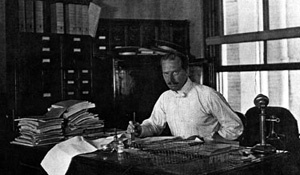 Arthur L. Day, first director of the Geophysical Laboratory, 1906. From 1906 to 1907, architects, designers, and construction workers labored tirelessly until the laboratory was finished at the Upton Street campus in northwest Washington, DC in June of 1907. The total cost exceeded $300,000. Under the watchful eyes of Director Arthur L. Day, the Geophysical Laboratory flourished and rapidly established a reputation for excellence in physical-chemical studies of rocks and minerals. This tradition of excellence has proved a trend over the last one hundred years. Programs in volcanology, seismology, high pressure research, and experimental petrology followed in the 1910's and 20's, driven by great contributions by such renowned Laboratory staff members as N. L. Bowen, H. S. Washington, and G. W. Morey. Crystal structure determinations using x-ray diffraction were initiated in 1919 under R. W. G. Wyckoff. Upon Philip Abelson's arrival as director in 1953, the Geophysical Laboratory broadened its investigations to include biogeochemistry. In the 1970's and 80's, a flourishing mineral physics program was begun. In the 1990s, its program expanded to areas of materials physics and microbiology, with a focus on extreme environments. Broad Branch Road Campus today. 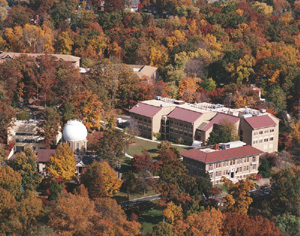 In 1990, the Geophysical Laboratory co-located with Carnegie's Department of Terrestrial Magnetism on its current site on Broad Branch Road in Northwest Washington, D.C. The move proved advantageous, facilitating cooperation between the Department of Terrestrial Magnetism and Geophysical Laboratory scientists for experimental and theoretical purposes.